All posts in this forum must be about your own setup with XBMC. Also, if you have 2 setups, you make 2 topics or one? Can we have some sort of rating the setups? So the most beautiful ones , get more starts... and are easily to find back? - Create a new post on XBMC forums and click the imgur button on the edit window toolbar. Copy the ID number into here. For different setups, please create separate threads. And yes you can rate the threads using the stars function on the forum view. The best ones can be put on the xbmc main page! - Create a new post on XBMC forums and click the imgur button on the edit window. Copy the ID number into here. Tapatalk does not recognize the [imgur] code!!!!! True! I noticed that too. (2013-08-06, 02:49)Smitty2k1 Wrote: Tapatalk does not recognize the [imgur] code!!!!! When you are typing a response hit the icon at the bottom that looks like a photo of two mountains. 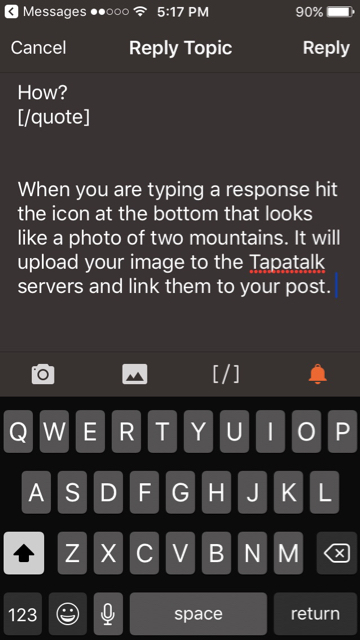 It will upload your image to the Tapatalk servers and link them to your post. Your initial comment stated "directly to the Forum", but that is not the case. It goes to tapatalk as you have now clarified. It goes directly to the forum you're posting in. It is not going to directly show the images as a gallery in your post but it will be a link directing away from Kodi and to imgur. You will have to select the back button to return to Kodi.